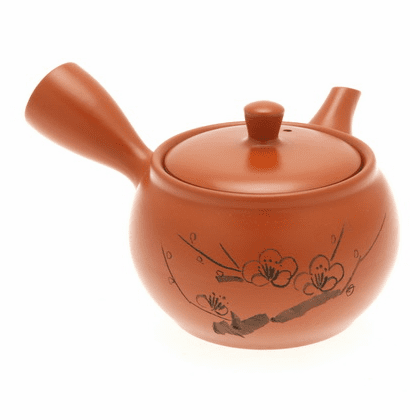 This plum branch in the red background ceramic teapot is 4-1/4 inches in diameter, 3-1/2 inches tall and holds 14 oz. Has a built in mesh strainer located inside around the tea pot. Please remove clear plastic guard over the tip of the Kyusu spout before use. It is to protect the spout from breakage during transport. Please click on pictures to see detail.